We made it! Well, sort of. Including this post, I actually did 27 out of 31. I guess I’ll call that a “mostly” successful 31 Days series. I sincerely hope that you enjoyed it, learned something, were encouraged, or got to know someone. It has been fun, but a lot of work, and I’m ready for a break. 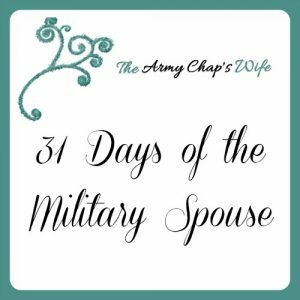 I have learned so much about these amazing people called “military wives,” past and present, and I have such a respect and admiration for these women who endure(d) much in order to love their husband and support his desire to serve our country. If you would like to catch up on any of the posts in the series, they will all be in the introduction post! Thanks for tagging along on this month-long journey. I am so proud of you!! I want to try it one year, but the 5/10 day series stress me out, I can’t imagine a 30 day one! Thank you my friend! I wasn’t sure at all that I’d be able to do it, but I’m glad I at least tried!